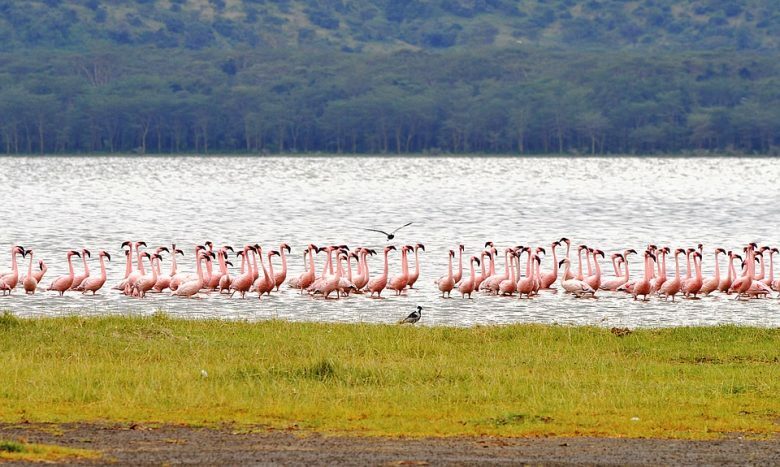 Arrive in Jomo Kenyatta International Airport, Meet driver-guide and be transferred to Lake Nakuru National Park heading straight for a game drive in Lake Nakuru National Park. 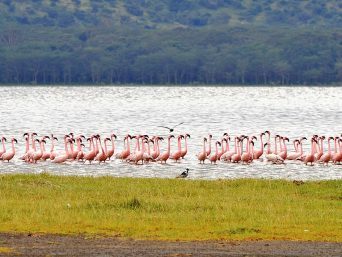 Lake Nakuru national Park:Established in 1961 and gazette in 1968 as a National Park, the park has Kenya’s largest population of rhinos. 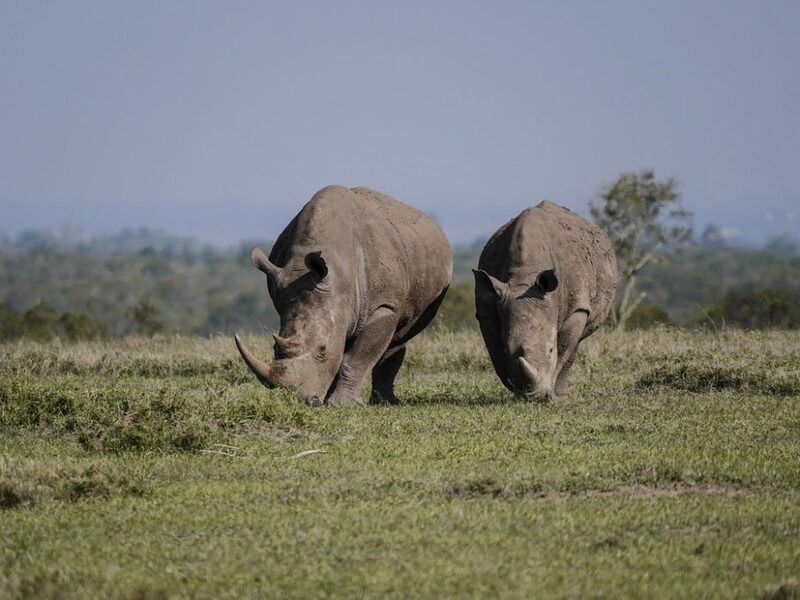 The park is home to Lion Hills, Makalia waterfalls, unique vegetation, Picturesque landscape, yellow acacia woodlands and a wide range of birds most famous being Flamingoes and Pelicans. 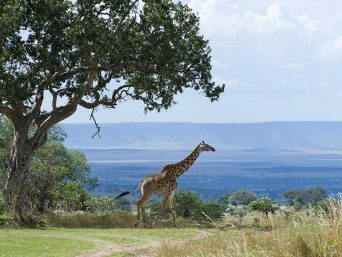 After breakfast drive to Masai Mara Game Reserve, Lunch at your lodge and enjoy an afternoon game drive in the Game Reserve. 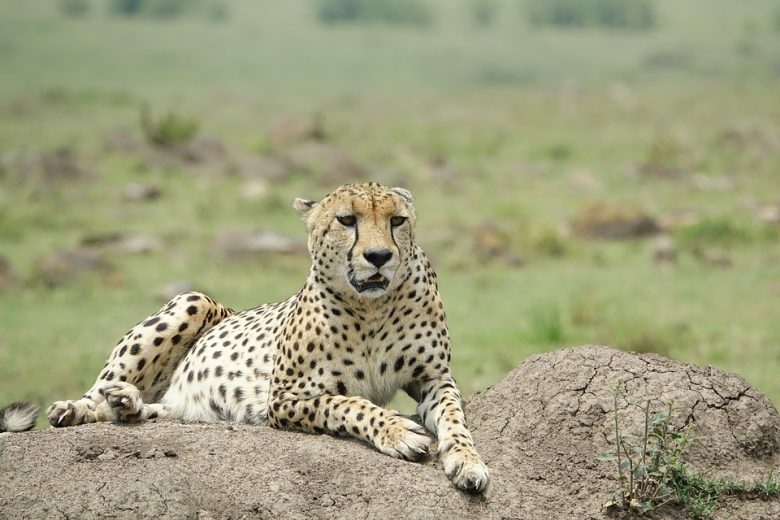 Masai Mara Game Reserve: The Land of Big Cat Diary and Disney’s African Cats, is considered a “must see” for any new and repeat visitor traveling on a safari to Kenya. 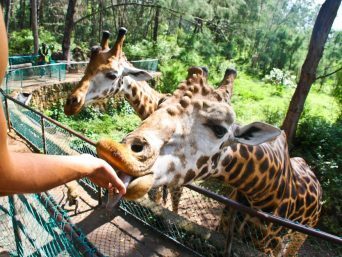 It is on the “to do” list for many Kenyans and visitors alike because the park is graced by a wide variety of unique and exquisite wildlife and birds. 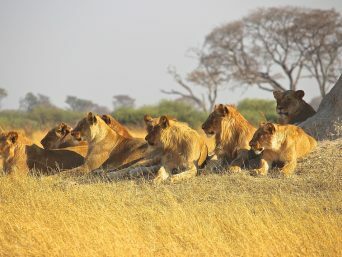 Masai Mara is the best place to see the “Big Five” animals (elephants, lions, leopards, rhinos and buffalo). 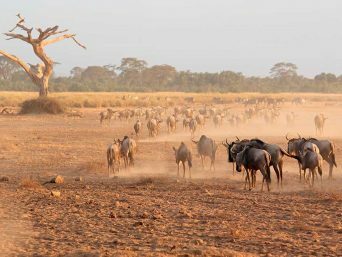 Home of the Great Wildebeest Migration:The location of the ’Annual Great Wildebeest Migration’ – one of the natural wonders of the world – is a gloriously beautiful, wildlife-rich savannah landscape. The annual wildebeest migration from June to October consists of over 1.5 million wildebeests, gazelles gnus and Zebras roar converge at the border of Tanzania’s Serengeti and Kenya’s Masai Mara making a spectacular entrance in a surging column of life that stretches from horizon to horizon, before finally plunging wildly into the raging waters of the Mara River, creating a frenzy as the fight against swift currents and waiting hungry crocodiles take priority. Those that survive crocodiles and raging waters cross over to the patiently waiting predators such as hyenas, jackals, leopards and lions for another survival battle. Breakfast in the and depart for a full day game drive with picnic lunch boxes or enjoy morning and afternoon game drives in Masai Mara Game Reserve with lunch break in between the game drives. After approximately one hour aloft, the balloon lands while a breakfast is being prepared for us nearby. The smell of bacon, sausages and eggs drift on the breeze as we sample exotic Kenyan fruits and homemade pastries and, if you wish, glasses of bubbly to toast our flight, a tradition initiated by the Montgolfier brothers. After breakfast drive to Lake Naivasha arriving for lunch just after checking into your lodge. After lunch enjoy an afternoon boat ride and bird watching in Lake Naivasha. After breakfast drive to Aberdares National Park. 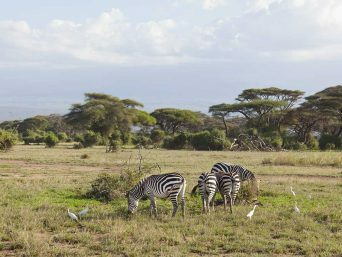 Well known to the world as the home of succession where in came a princess and out went the Queen of England while at Treetops lodge, Aberdares is a land of fortune and diversity. The Park got its name from Lord Aberdares, one of the founder members of the Royal Geographical Society. 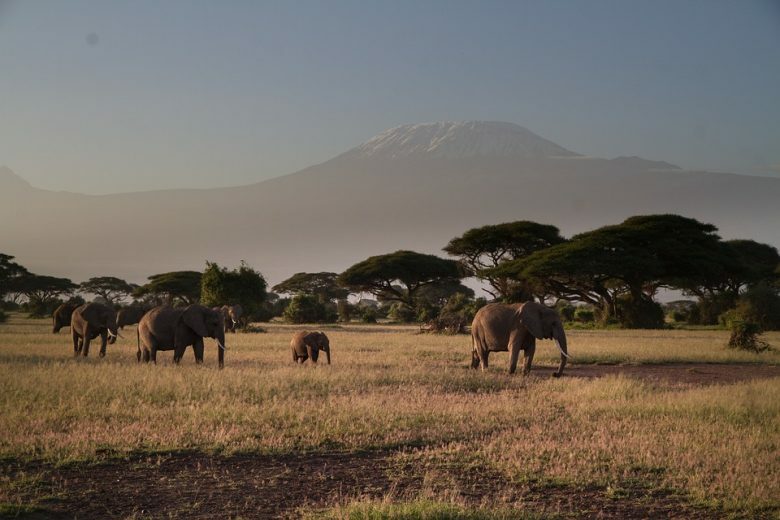 Activities;Include Night viewing of wildlife at the Ark & Treetops, Game Drives, Trout fishing, and visit to the Kimathi hideout used by the legendary Mau Mau General. After breakfast drive to Olpajeta Conservancy arriving for lunch, then have an afternoon game drive in Olpajeta Conservancy. 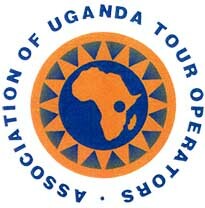 Host to all the ‘Big Five’. Central waterhole that attracts a wide variety of game. Higher wildlife-to-area ratio than any Kenyan park. Camel rides at an extra cost. After breakfast drive to Samburu Game Reserve arriving for lunch, followed by an afternoon game drive in Samburu Game Reserve. Samburu National Reserve was one of the two areas in which conservationists George and Joy Adamson raised Elsa the Lioness. The presence, of the Ewaso Ngiro River and its shady trees, attracts plenty of wildlife. 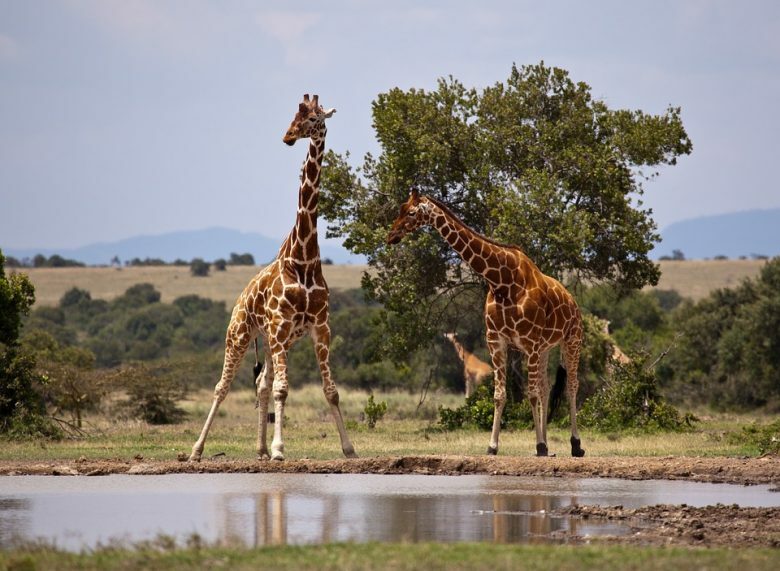 Giraffe, large herds of elephants, buffalo, gerenuks, gazelle, waterbuck and zebra (including the endangered Grevy’s zebra) from the surrounding savannah plains trek to the water. Lion, leopard and cheetah are also quite easy to spot, thanks in part to the lack of grass cover. 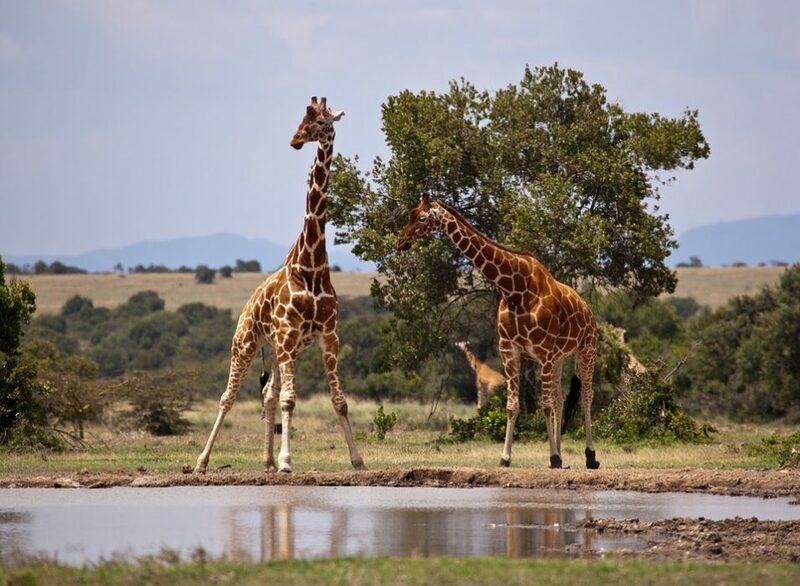 The reserve provides the opportunity to see wildlife that only lives in the dry north of Kenya; namely: the long necked gerenuk, Grevy’s zebra, reticulated giraffe and Beisa onyx. The elusive Kenya leopard is often known to visit the park, especially in the evenings. After breakfast drive to Meru National Park. The Park is famous as the setting for Joy Adamson’s book “Born Free”, the story of the Adamson’s life and research amongst lion and cheetah. The park is wild and beautiful straddling the equator and bisected by 13 rivers and numerous mountain-fed streams. 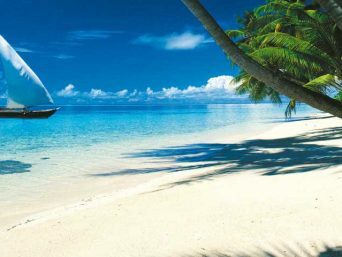 It is an especially beautiful area of Kenya. It has diverse scenery from woodlands at 3,000ft. On the slopes of Nyambeni Mountain Range, Northeast of Mount Kenya, to wide-open plains with wandering riverbanks dotted with doum palms. 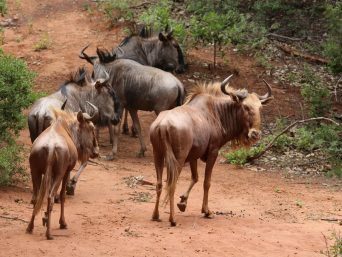 Animals Attraction: Animals that can be viewed here include: lion, elephant, cheetah, leopard, lesser Burchell’s Zebras, Gravy Zebras, Masai and reticulated giraffes, Grant gazelles, gerenuks Kudu, duiker and dik-dik, one of Africa’s smallest antelopes. 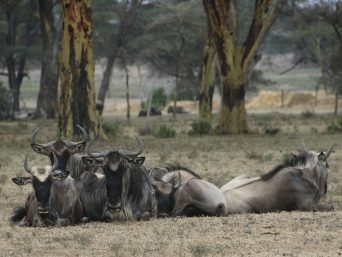 Large prides of lion can be seen and some of Kenya’s largest herds of buffalo. 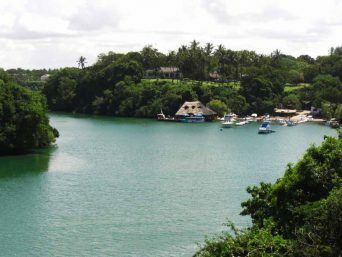 The rivers abound with hippo and crocodile, fishing for barbus and catfish is permitted at camp sites and along the Tana River. 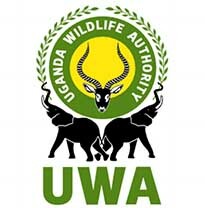 Birds Attraction: Over 300 species of birds have been recorded including: the Peter’s fin foot which inhabits the Murera and URA Rivers, the Pel’s Fishing Owl, Kingfishers, rollers, bee-eaters, starlings and numerous weavers. 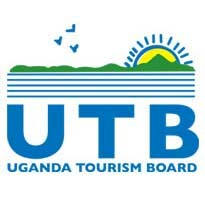 Enjoy your Lunch and afternoon game drive in the park. 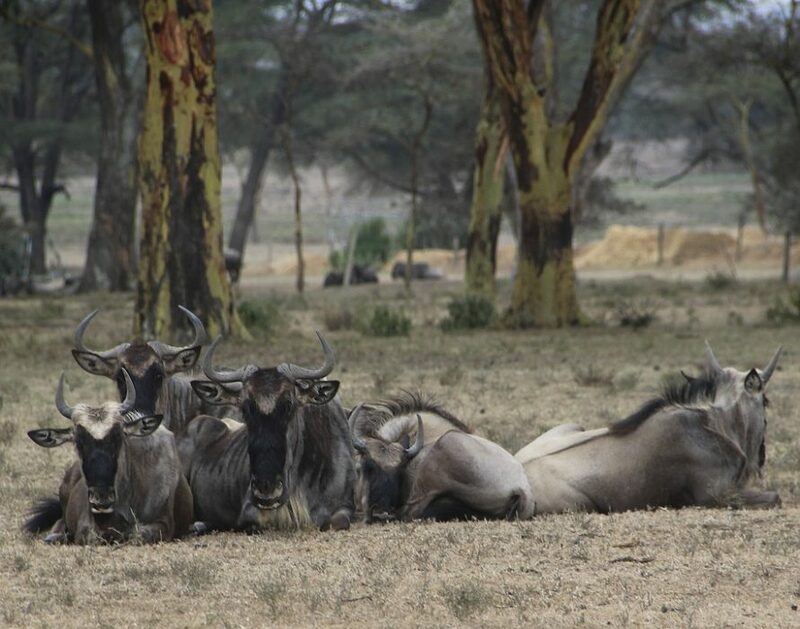 Breakfast in the hotel and depart for a full day game drive with picnic lunch boxes or enjoy morning and afternoon game drives in Meru National Park with lunch break in between the game drives. Breakfast in the lodge and drive to Nairobi with your optional lunch at a city restaurant. Next will be your transfer to the airport in for your home bound flight.